Clare will deliver the Deborah Battigelli Memorial presentation at the Forum with a talk titled "Long-term trends in dissolved oxygen, nutrients and primary production in embayments of Lake of the Woods that support lake trout". 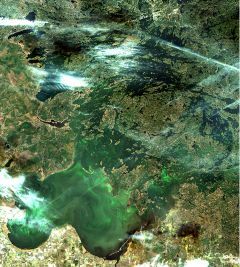 The view from space is compelling with blue green algae blooms covering most of the lake in late summer and fall as can be seen in this European Space Agency (ESA) Sentinel satellite image from October. A new generation of satellite sensors came on line this year – delivering high resolution detection and tracking of algae blooms. At our Watershed Forum in March, Dr. Caren Binding (Environment and Climate Change Canada) will present a preliminary report on her work on Lake of the Woods to develop near real time severity assessment and tracking of algae blooms.